(331/9) 156-160 Eddy Street; Hotel Cecil (1907), Hotel Russell (1911), Hotel Kern (1923), William Penn Hotel (1984). Rooming house with 109 rooms and fifty-four baths. 4B stories; brick structure with terra cotta trim, decorative brickwork; ground level order with rusticated second level and two-story pilaster order above; two-part commercial block composition; Renaissance/Baroque ornamentation; arched entry with coffered vault; lobby: beamed ceiling with cove cornice; Moderne style blade sign with recent neon “Exit Theater”; alterations: some storefronts replaced with aluminum sash. 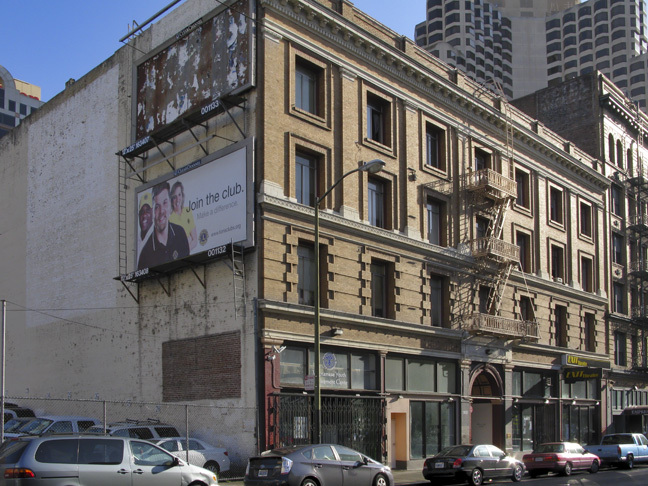 Owners: Gustav Sutro (1907), Roman Patel (1982), City of San Francisco (2007). Architect: Albert Pissis, 1906. Designed by Albert Pissis, the architect of the Flood Building and the Hibernia Bank Building at 1 Jones Street, the William Penn is one of a few hotels in the district with storefronts that have remained largely intact (note the transom windows, ironwork, and recessed doorways). Next to it is the Empress Hotel. The well-known and much-loved Albatross Bookstore was a tenant until 1983, when the storefront was leased by the Exit Theater, producer of the annual San Francisco Fringe Festival. I’ve lived here since August 2010. I’m interested in local history and am glad to see my building has some. By the way, My window on the 3rd floor is in the pic! I closed the Albatross Book Co. in 1997. A Vietnamese youth center occupied the space some time later. The Exit Theater entrance is on the other side of The William Penn doorway [righ side from the street]. Thanks for the info re: the Albatross’ closing date, George. My personal memories of the bookstore are from a couple decades before then.